We stayed for three nights at the Sunshine Hotel in Hoi An in March 2015, choosing the location for a short break as we hadn’t been to Vietnam before and the town, a UNESCO World Heritage Site, is a lot quieter than Saigon or Hanoi would have been. There is a convenient direct flight from Hong Kong to Da Nang, and the hotel arranged a taxi for the half hour’s drive from the airport. There is a lot of resort development going in the area – making it one of Vietnam’s most prosperous regions – but the hotel is away from the coast and about a mile and a half outside the old town. Facilities were good and staff pleasant and helpful, the only real failing being the failure to cover fruit etc. on the breakfast buffet counter so quite a few flies joined the party! We also found that the hotel could exchange only US dollars, not HK currency, which would have been a real headache if banks had not been open early enough in the morning for us to get the money for the day’s excursion. Hoi An was one of the most important ports in Asia until the silting up of the Thu Bôn river at the end of the 18th century, after which the old town remained virtually unchanged architecturally, preserving both merchant’s houses and temples or meeting halls of the different merchants’ guilds, particularly those from various regions of China. According to the Lonely Planet guide, during the Vietnam War both sides tacitly co-operated to ensure Hoi An remained undamaged by the fighting. The historical area is fairly compact and pedestrianised so tourists wander around using tickets bought at offices around the perimeter to enter the key buildings. There are numerous restaurants and souvenir shops but these do not spoil the generally relaxed atmosphere. On the second day we visited the Champa remains at My Son (美山) about 50 miles away, booking places through the hotel on a tour bus which picked us up at 8 a.m. and reached the site in a bit under two hours, including time taken collecting tourists from other hotels. We took the option of doing part of the return journey by river boat, with a very simple lunch provided on board. The guide was the son of a senior military officer who had been the Viet Cong commander in the area during the war. The Cham people, who arrived from what is now Malaysia and Indonesia, started building the My Son complex in the 4th century A.D. with temples to Indian gods and inscriptions in both Sanskrit and the Cham language using a script derived from South India. They were both traders and pirates and eventually had to retreat further south as the Vietnamese grew more powerful. Their descendants survive as a distinct ethnic group both in Vietnam and Cambodia and the Vietnamese or Eastern Cham still use their Indic script. By chance, the following day we went into the restaurant owned by an Italian archaeologist who was working on the restoration of some of the monuments. He explained that the motivation behind the Cham adoption of Indian culture was probably the wish to be taken seriously by the Chinese, who were present all over the region from very early on: much of what is now Vietnam was controlled by the Chinese empire from the end of the 2nd century B.C. to the mid-10th century A.D. The archaeologist is one of those who believe that the Cham never formed a single, united state, even though scholars from different regions of Vietnam often try to claim that their own one had been the principal centre. Our visit coincided with official celebrations of the 40th anniversary of the re-unification of the country at the end of the Vietnam War, described, according to ideological standpoint, as the liberation or the fall of South Vietnam. Ironically, the shelf of English language books by the hotel reception desk included Frank Dikötter’s The Tragedy of Liberation: A History of the Chinese Revolution 1945-1957, a no-holds-barred indictment of Mao’s regime. Presumably the book had been bought outside Vietnam by a tourist who then left it at the hotel, as the town’s bookshop contained nothing critical of the communist system. I did not try raising political issues with the My Son guide, but he did himself mention in his historical summary that if the Communists had lost the war the country would have remained divided like North and South Korea. What would such an outcome have meant for ordinary Vietnamese? Going by the Korean parallel, things might have been better for the south but worse for the north than they are now. Even if we set aside the downside of `liberation’ in Vietnam’s case – in particular the mass exodus of the `boat people’ – and also assume that the South Vietnamese peasantry were better off under the new regime than they would have been under the old one, there’s the problem of whether victory was bought at too high a cost – around ten million dead. There is a parallel here with the never-ending controversy over the First World War: the victors succeeded in preventing Germany’s emergence as a hegemonic European power but many have argued that result was not worth the human cost. Looking at the American side, hindsight suggests that accepting Ho Chi Minh’s overtures immediately after WWII would have averted the conflict and probably produced a milder Communist regime than the one which actually emerged. The mistake was to see the Vietnamese communists as proxies for Russia and/or China rather than as primarily Vietnamese nationalists, a mistake easy to make given that the civil war within Vietnam was so entwined with international geopolitics. Nationalist animus against China was evident in the town museum which displayed a well-known 19th century map of Vietnam (from Jean-Louis Taberd’s 1838 Latin-Annam (i.e. 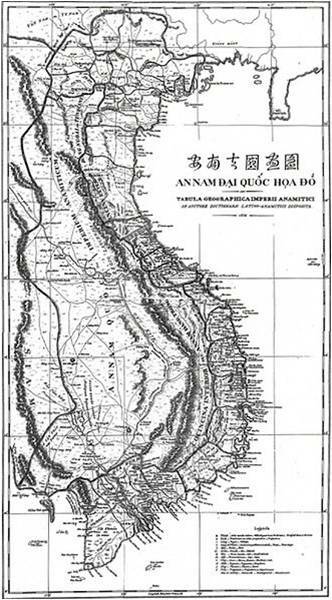 Vietnamese) dictionary), adding the information that this showed the Paracel Islands (occupied by China during the Vietnam War) as part of the Annamite empire. ​Three days in one corner of Vietnam certainly doesn’t allow you to draw conclusions on the overall state of Vietnamese society but the `feel’ of the place did remind me rather of Thailand, the country in South-East Asia I’m most familiar with. Perhaps symptomatic, was something we saw on the journey back to Da Nang from Hoi An. We passed a vast collection of statues, evidently the output of one factory. They mostly seemed figures from Buddhist and other mythology, with just one single statue of Ho Chi Minh among them.